Anyway, I was in my garden today, recording a vlog. I decided to do it in the garden because although I made my first YouTube vlog in April last year, I didn’t make a single one in the garden, probably because I was trying to keep my video-related activities as secret as possible. And today was such a lovely day! After I’d finished filming, I walked around taking photos of the flowers and plants that are already coming up all over the place. 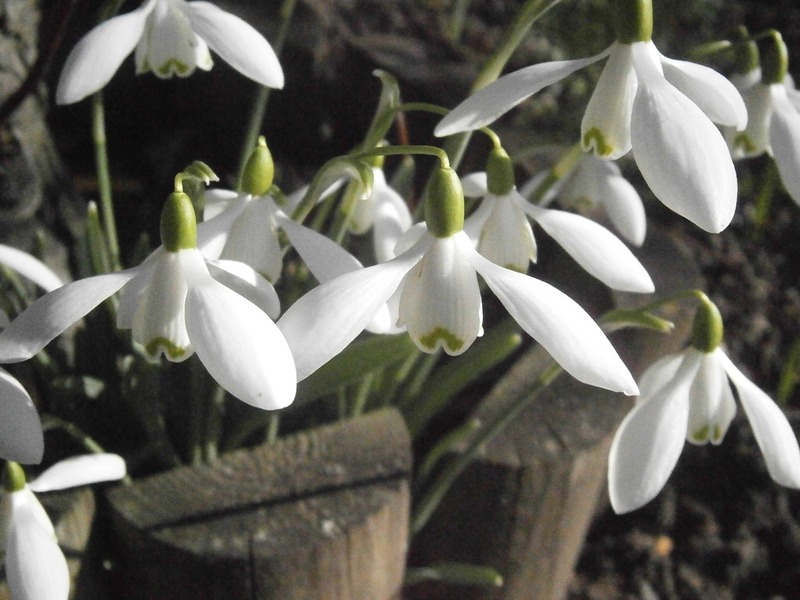 The predominant flowers were of course snowdrops, though we’ve had very little in the way of snow this year. I love them because they look so delicate and pure. Here, they’re growing at the bottom of the trunk of one of the many fruit trees in our garden. I think this one in particular is the rather unsuccessful plum tree, but I’m not sure. I don’t know much about flowers, so I can’t tell you what type of bloom this one is. If anyone knows, please leave a comment! I love the way these vary from very purple to very blue and everything in between. The orange in the middle is also a nice contrast. This one is mostly in shadow, partly because of a tree and partly because I was taking the photo from an angle that mostly blocked the light, but I like the way there’s a little bit of sunshine just in front of it. And, again, there’s a snow drop behind it. 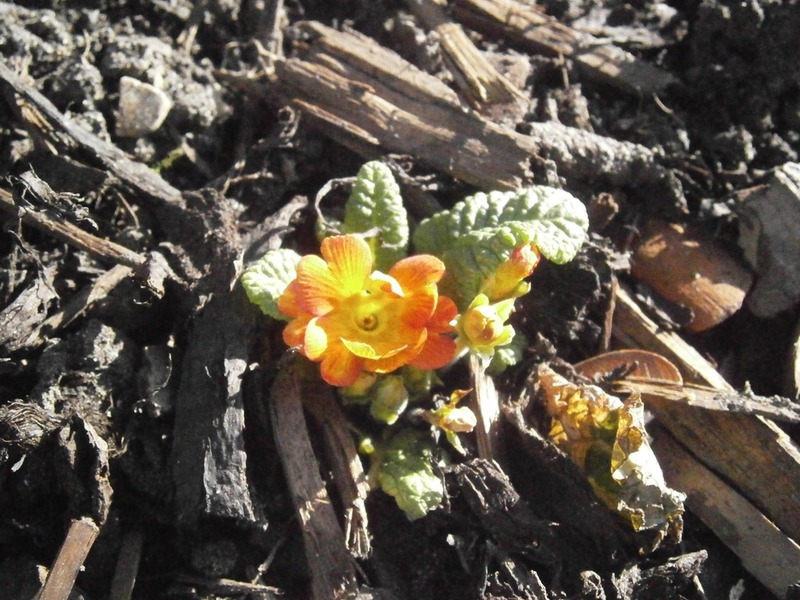 This was pretty common – the flowers are growing in clumps all over the place. I like the contrasts in this picture – not just the sunlight and the shadow, but also the colourful flowers against a muddy background. Again, I’m not entirely sure what type of flowers these are, or even if they’re the same time as the last photo, but they’re pretty and that’s all that matters to me! For those who are wondering, these photos were taken on an Olympus compact digital camera, fourteen megapixels, using the ‘super macro’ mode. This means that it’s great for taking close-up photos, if you can get the focus on the flowers, and it’ll often blur the background for you. If the focus is in the wrong place, though, you just end up with a pretty rubbish photo! I got this photo the day before I went to France in the summer, and so spent a lot of the week experimenting. I think I’ve mostly got there now. There were also some parts of our garden that aren’t very pretty at the moment, but show potential. 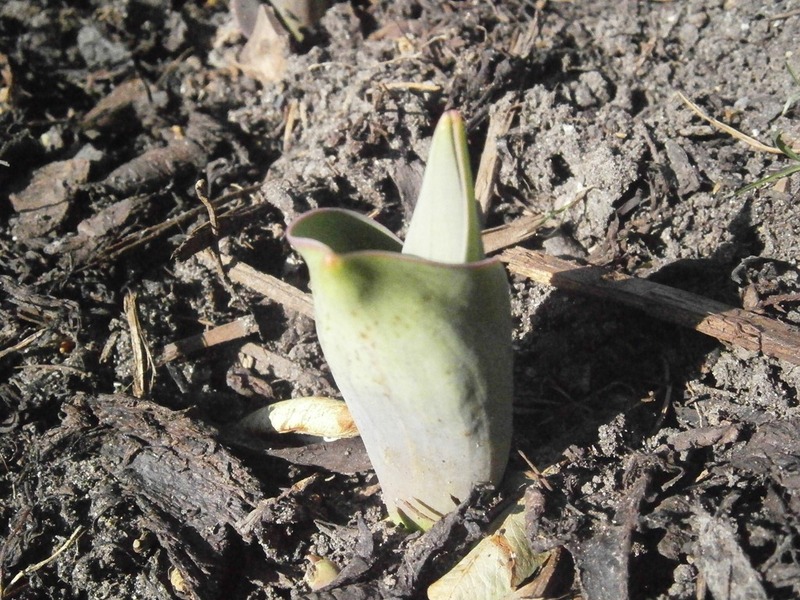 For example, in the new patch of garden where we chopped down a large tree, there are some tulips just coming up. 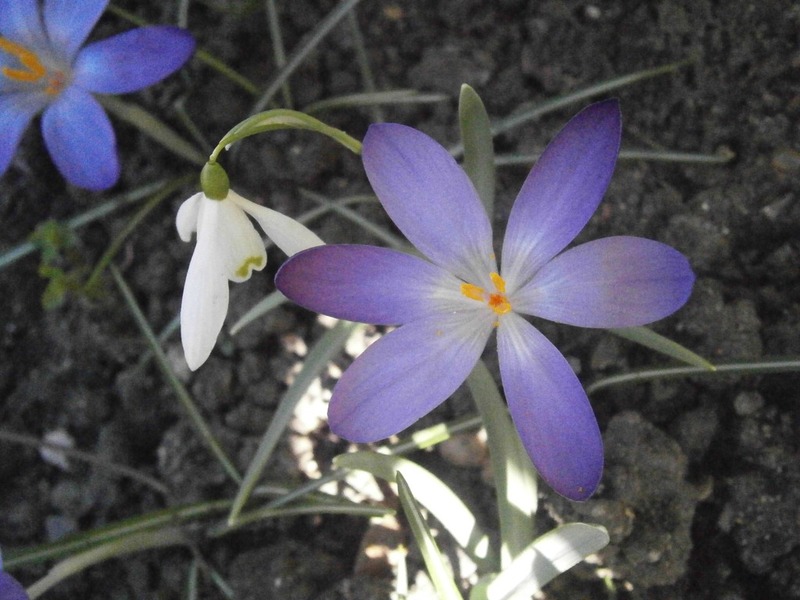 In the past I have complained that our garden is too ‘shrubby’ – I’m insisting on lots of colourful flowers this year! The area shown here, where the tree used to be, sort of belongs to me, as I asked for a patch I could have for my own. I plan to plant the most colourful flower seeds I can find, as a rebellion against the greens and browns of the rest of the garden! 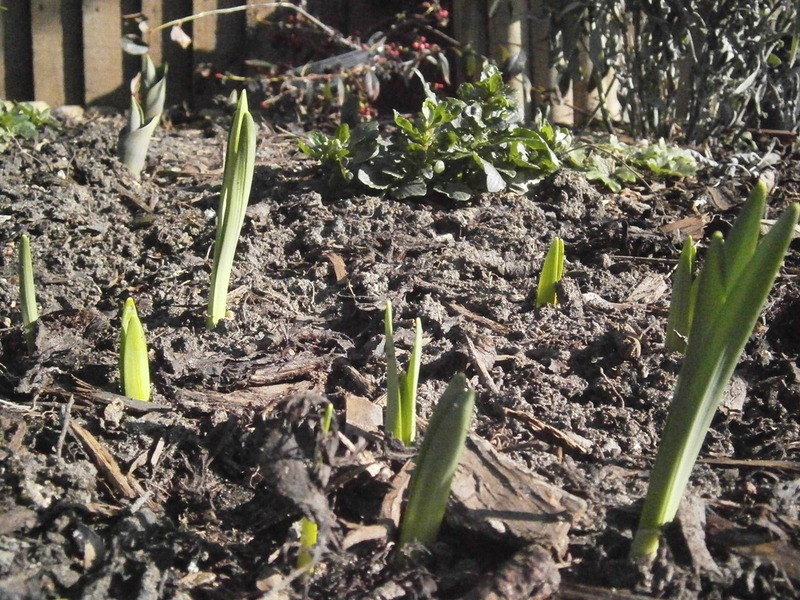 I’m told that these are going to be tulips, anyway. I’m no gardener and have yet to find out how you tell – unless you’re supposed to remember what it was you planted? I have trouble remembering where I put the cup of tea I made a few minutes ago, let alone what seeds I put in the ground months back! 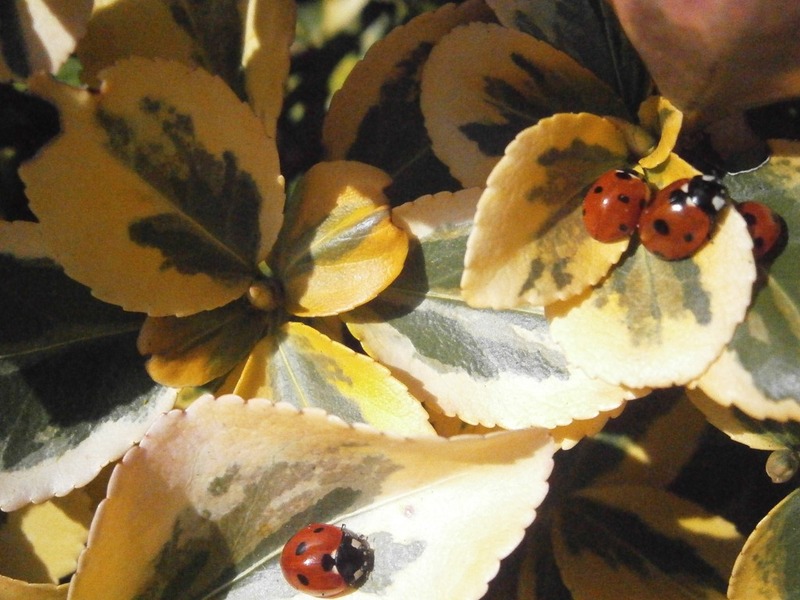 You can’t see it in these pictures, but there are four ladybirds all huddled together – one of them is completely hidden under the leaf, behind the other. The other ladybird seems quite solitary by comparison and I wonder if it’s had an argument with the others. They were sitting quite still, and only shuffled around when I moved the leaves to try and expose the hiding bug, but didn’t succeed. Even then they didn’t fly off – they were resting quite peaceably. 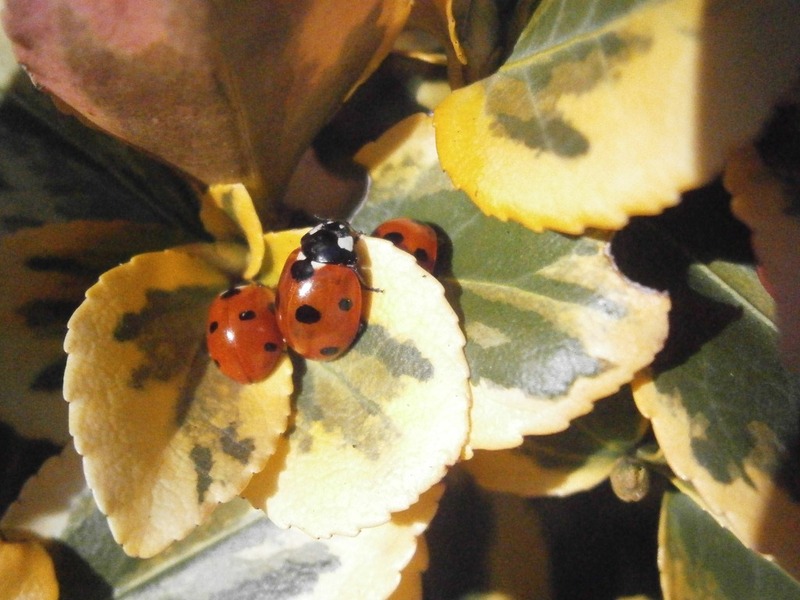 I love ladybirds. They’re colourful and pretty, and it’s hard to remember they’re insects just as much as the annoying flies that get into the kitchen in summer and have to be chased out before they land on your food! I’ll finish with another photo from the new bit of garden. Apart from a mint bush that’s rather brown and uninteresting at the moment, there’s little in there, and at first I wasn’t sure if this was a weed or not. I’m assured, however, that it is in fact a very small flower (though these close-up pictures make it hard to tell the scale of things), and it’s bright and colourful on a dark background, so I’m rather fond of it. What’s the weather like where you are? Is it hinting at Spring, or are you still wearing your winter coats? If you’ve got sunshine, I recommend going outside. There’s something very cheering about sitting on the grass in just a t-shirt and thin cardigan when you’ve been wearing a coat and scarf for what feels like forever. Thank you :) I don’t mind winter… when I’m inside, watching it from next to a radiator. I have a thing for not losing my fingers to frostbite. I think I’m probably the only one. Not especially warm today, though I went for a walk on Friday at lunch (my nose was too stuffed up to Zumba). The kids are out playing in the sun while I soak up the silence and the sun from inside. But spring has got to be around the corner. 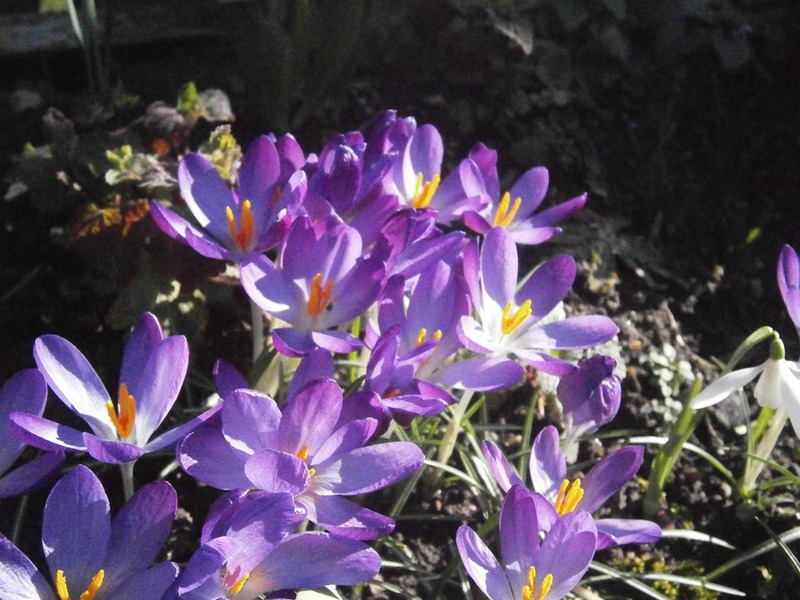 the crocuses (sp? O.o) are peeping up, we’ve got one in our garden. And the vines were all sprouting their leaves on the trail behind my work. Wow, those are some BEUTIFUL pictures! We were getting close to spring…and then it snowed. This morning it was 7 degrees F outside. So now flowers for us. Aww :) And ha ha, sympathy on the spelling. I’m like that in the mornings, if I even make sense at all!